Madras High Court Vacancy 2019 For 68 Law Clerk On Ad-hoc Basis. High Court Of Madras, Is Appointing Eligible 68 People To The Post Of Law Clerks To Hon'ble Judges, Madras High Court, On Ad-hoc Basis. So Interested Can Apply For This Job Through Offline & Email Mode, Within The Given Time. Law Clerks →68 Vacancies, Kindly Do Check Out The Image Below For Eligible Criteria. B. 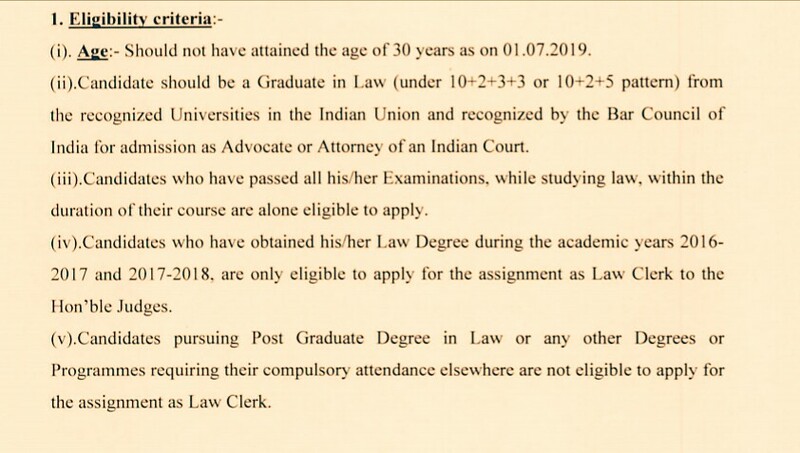 Eligible Criteria For Law Clerks Job Vacancy In Madras High Court Recruitment Notification 2019. Educational Qualifications →Again Go Through The Image. Mode Of Examination/Selection Process →Viva Voce. How To Apply/Last Date For Offline Application Form Submission →Kindly Do Check Out These Images. For More Info→The Official Website Of Madras High Court, Chennai. Now Apply For This Job Of Madras High Court For Law Clerks Post. Click Here To Download Both Application Form/Notice.